Many vocal coaches these days, including me, give lessons via phone and Skype (webcam). You may wonder how these distance vocal lessons can be effective, because we can't see each other by phone and sometimes the Skype video signal is so bad it doesn't help much. Well... they do work, and very effectively. 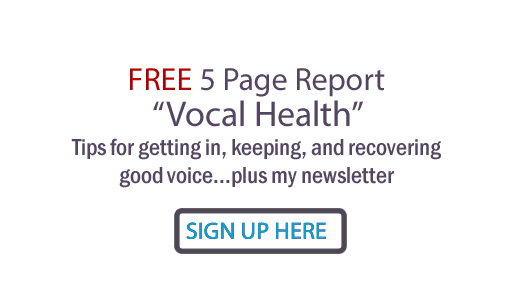 An intuitive vocal coach can hear your voice diagnose problems such as when you have a constricted throat, stuck soft palate, tight jaw, if you're using eyes, brows and facial expression, if your facial mask is tight, if your ribcage is wide, if you have a stiff spine, if you're using your breath power from low enough, if you're connected to your spine and all kinds of other things. Why? because the sound of your voice is affected by all these things. It can help to have an in-office lesson so I can adjust you by touch and so you can see me demonstrate, but I can talk you through most vocal technique corrections without you being physically present with me. I give lessons by phone and Skype to clients regularly scheduled every week. I've vocal coached and warmed singers and speakers up when they were in their houses thousands of miles away, nationally and internationally, in TV show green rooms, in parking lots outside venues, in vehicles on the way to gigs, once I had an emergency call to warm someone up and did so from my own car in a Home Depot parking lot! By phone, It helps if you have a landline for better signal, but cellphones work, too. You just call me when your lesson time begins. Put your phone on speakerphone if possible so you don't have to hold it. For Skype, you just need a simple webcam for your computer. If you don't have an account, download Skype (it's free) and set it up - click the 'getting started' link at the Skype user guide here. You'll 'Skype call' me when your lesson time begins and I'll be waiting for you at my own computer/webcam. You can sing acapella (or speak), but it's helpful if you can have music tracks and a player nearby to sing with. I don't need to hear the tracks very well, I'll just focus on you. I can record the vocal exercises I give you... right over Skype. I use Supertintin recording software and then email you the resulting mp3 audio file. So don't worry if you can't get in... just contact me to schedule a lesson by phone or Skype and find out just how effective it can be for you. No matter where you are, you can find me for help! Anyone out there ever had a vocal lesson by phone or Skype? I've had just one vocal lesson by Skype with Judy Rodman and it was remarkable! I've had a friend comment on the improvement, others talked about the use of technique and how it made me look like I knew my voice well enough and what gesture was needed to achieve specific sounds. I endorse Judy Rodman as Vocal Coach of the Century. I look forward to engaging in more vocal sessions with her in the near future.